I am so excited to be visiting Killer Characters. My name is Carmela Bertrand I own the Memory Mine Scrapbooking shop on Governor Nicholls Street in the French Quarter of New Orleans. Let me tell you that New Orleans is a dynamic place to live and work. The atmosphere is always crackling with the vitality of a town filled with social events small and large, all contributing to keeping us a tightly woven community. One of my favorite events is the Winter Market. I always consider it the official start of the holiday season. Restaurateurs and other venders set up along the banks of the mighty Mississippi and offer samples of food, liquor and other wares putting everyone in a festive mood. Still, it isn’t always “easy” to live in the Big Easy. When my BFF Ava Gruiex and I were strolling through the Winter Market, we witnessed an ugly scene. Quigg Brevard, a restaurant owner I briefly dated some time ago, was bellowing at a man, really threatening him. Turns out the man, Martin Lash, was a reviewer who gave a scathing review to Quigg’s pride and joy restaurant, Mumbo Gumbo. We tried not to let the fight upset our mood but things got much, much worse. A few minutes later while Ava and I were looking for treasure at a fancy clothing display booth, the very same Martin Lash came stumbling around the boutique tent with a huge kitchen fork stuck in his neck. He dropped right at our feet, dead as a stone. Well the last thing I needed was to have my long time beau Detective Edgar Babcock find me at the scene. But there I was when he pulled up and within a few minutes he discovered that Quigg Brevard was there as well. Let’s just say, Babcock isn’t always as cool as he pretends to be when it comes to my being anywhere near Quigg or anywhere near one of his murder cases. To give everyone a chance to learn more about the events that follow, we are giving away a copy of CrepeFactor to one lucky commenter below. Just give a shout out to New Orleans. You like it or you love it or you want to visit for the first or the twentieth time. Tell us anything but don’t forget to include your email addy in this format: name(AT)server(DOT) com to avoid the spam bots. Giveaway closes at midnight Friday, October 21st. I really want to visit there! I have never been but really want to go. We plan on maybe going this winter. I've never been to New Orleans but would love to visit there. My parents went many years ago and said it was exciting and unique. dbahn(at)iw(dot)net. I am so excited Carmela is here too! 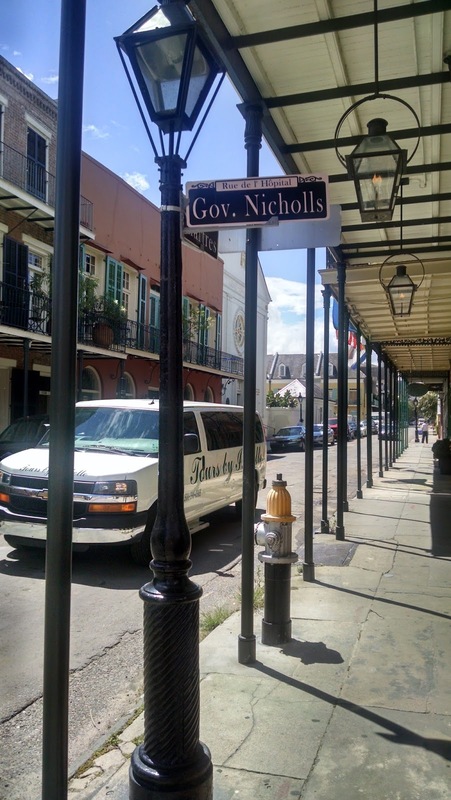 I have never visited New Orleans, but it's one of my husband's favorite trips as a kid! Hopefully someday, we'll go there together! Thanks! I went to New Orleans in 1976 with a couple of college friends for Mardi Gras—we had THE best time (gee, I can't believe that was 40 years ago now—LOL)! I've never been but would love to visit and learn more about its history. Always wanted to check out New Orleans and see the spooky side of the town! 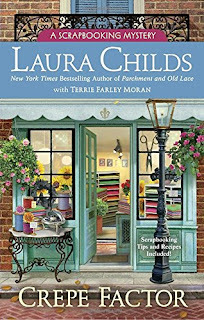 And huge fan of Laura Childs Tea Shoppe mysteries! Hi Terrie, I'm so jealous that a close friend of mine got to visit NOLA this year. My wife and I are huge fans of this series and in fact all of Laura's books. We own about a dozen of them so far. I'd be thrilled to add this one to my home library. I have been before but it was bc-yes that is before children. Long time oldest just turned 30. We really need to do a girls weekend. Maybe for my birthday this next year(january). I really loved it, great place, especially since I have started reading this series. Thank you for the giveaway and great books. I've never been to New Orleans except the Disneyland version but I would love to see the real thing someday. Thanks for the giveaway. Visiting New Orleans is on the top of my bucket list. Good morning. I am so happy to see such grand interest in CREPE FACTOR and in the fabulous city of New Orleans. I haven't been since I was in highschool. Would love to visit again. Thanks for the chance. I love New Orleans and need to plan another trip there soon. Can't wait to read "Crepe Factor", New Orleans and the French Quarter are a great place for a murder mystery. I have been to New Orleans twice and would love to visit again. I've only visited one time, I went to visit one of my friends. We only had a couple of days so we didn't get to site see very much. We did go and eat beignets. I have never been to New Orleans and don't plan to go. Too many other places to visit since our kids live all around the country. 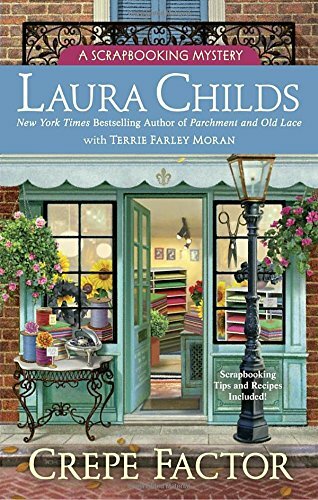 I have been to the New Orleans in Laura child's books. I wonder sometimes if I physically get there one day if it will be like I have imagined. I will be excited and apprehensive all mixed up. I have every book so far, love them all. I have never been to New Orleans but I would love to. I love hearing the jazz. A fork in the neck? How messy. Went to New Orleans once in high school when I was scouting out possible colleges. Sadly, I was too young to really get a proper taste. I've never been there but Carmela pulled me into the story so now I need to find out. After reading the Scrapbooking series, I would love to visit New Orleans! I visited New Orleans for the first time during this year's Bouchercon, and had an awesome time. Would love to go back again, or to visit New Orleans virtually by reading Crepe Factor. Have never been To New Orleans, but would love to visit. Thanks for the opportunity for the book! Giveaway is closed. Winner has been notified. Thanks so much to everyone who entered. And keep an eye on Killer Characters. There are frequent giveaways here. And the winner is Kelly Braun!! Congratulations! !